This broth is to be used in dish inspired by J.R. Ward’s Lover Eternal. 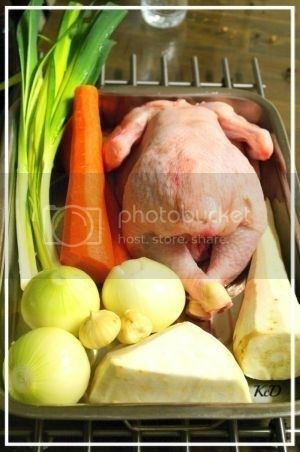 1.Put chicken in a large stockpot (5 to 10 litres) and add water so that the chicken is covered. Bring it to boil. Skim the foam. 2. Preheat the oven to 100 ‘C / 212 ‘F. 2. Peel the vegetables and rinse the leek. Chop them roughly. 3. Add the vegetables and spices in to the stockpot when the broth clears. Cook them until vegetables are almost soften. 4. Move the stockpot into the oven and let it simmer there overnight, 8-10 hours. Make sure that the chicken is covered with broth. Add water if needed. 5. In the morning, take the chicken out of the stockpot (this can be a bit difficult since the meat is so tender it almost crumples), peel off the skin and remove the meat from the bones. This can be used in variety of dishes, for example gravy, soup or casserole. I’ll save the bigger pieces of meat to my Lover Eternal-dish. 6. Strain the broth through fine sieve. 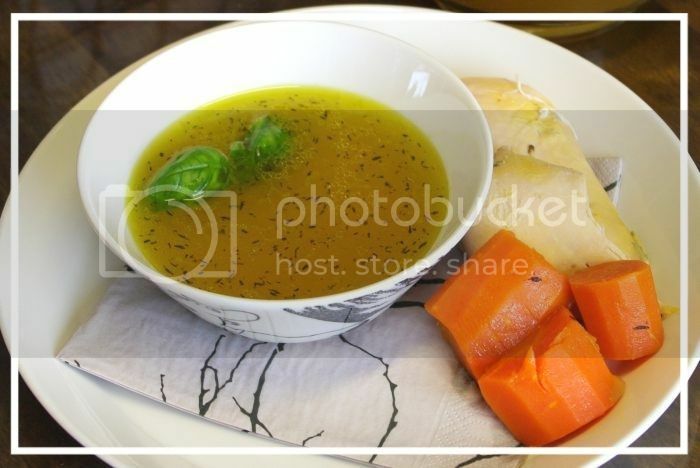 Also the vegetables can be used in variety of dishes, for example puréed veggie soup. 7. The broth can be used as such or as a ingredient in other dishes. Store the leftover broth in freezer.